Wondering whether or not Facebook affects your search ranking? It does! And it has a much bigger impact than you think. All of these affect your search ranking, which means that Facebook marketing should be included in your SEO strategy. 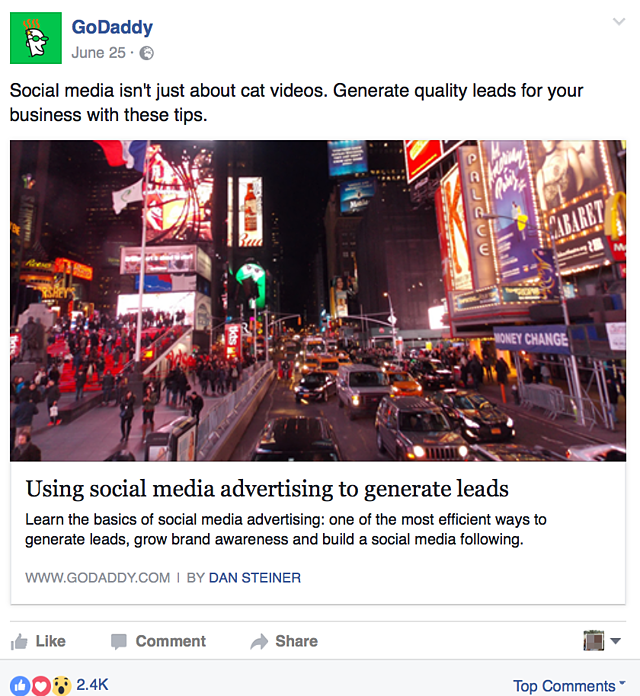 In this post, we’ll take an in-depth look at the correlation between Facebook marketing and SEO. You will also learn how to optimize your Facebook page and marketing efforts to improve your ranking. There is a huge misunderstanding when it comes to Facebook and its effect on search ranking. 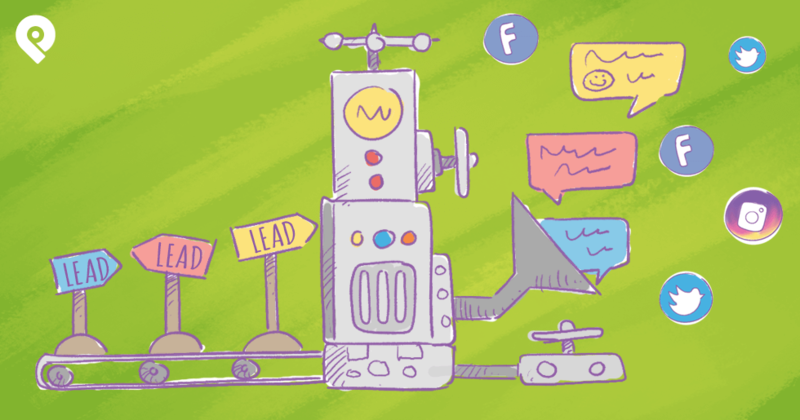 Some say Facebook shares and performance make no difference to SEO, but others beg to differ. For their most recent report on Search Engine Ranking Factors, Moz surveyed more than 150 reputable search marketers and asked their opinions on the top ranking factors. The survey found that social signals were considered to be one of the top 10 factors affecting search ranking. Social media does not have a DIRECT impact on Google’s search algorithm. There are, however, a lot of correlations between social signals and search ranking. For instance, if a lot of people share your content on Facebook, it means your content will be exposed to a much larger audience. More exposure means more people will be clicking on those links. A higher click-through rate translates into increased traffic, which is an important ranking factor. 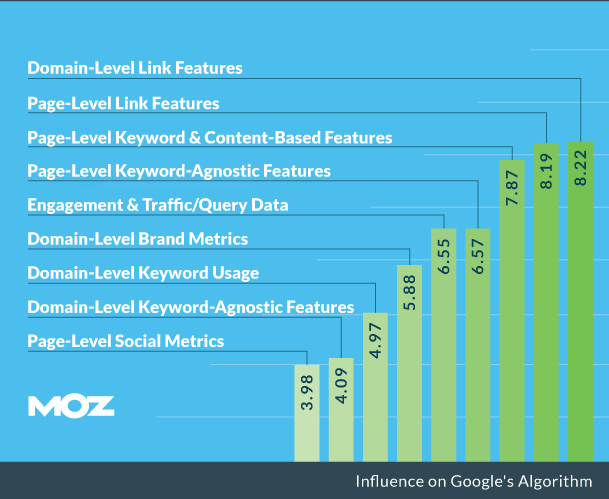 The Moz report also included a list of social signals that had a positive correlation with search ranking. The total Facebook count (number of shares, comments, and likes) showed the most significant impact. That was followed by Google+ shares, Facebook share count, Facebook like count, and then Facebook comment count. ...But to put it simply, the number of shares, likes, and comments you get on Facebook can INDIRECTLY impact your ranking. Therefore, this suggests that Facebook marketing can have a huge impact on your ranking. The more people share your content on Facebook, the better your chances of boosting your search ranking. Another important factor to look at is keyword usage. There is proof that optimizing your website content and meta data with relevant keywords can improve your ranking. But what, if any, impact does using keywords on social media have on your search ranking? Again, there may be no DIRECT impact of keyword-optimized social media content. When you search for a certain keyword on Google, you may not get results from social media, unless you enter the name of the social network. For instance, if I search for, “organic and wildcrafted herbs,” I get results of websites selling these herbs. However, optimizing your social media content with keywords CAN improve its visibility within each social network. In other words, it will be easier for social media users to discover your content. 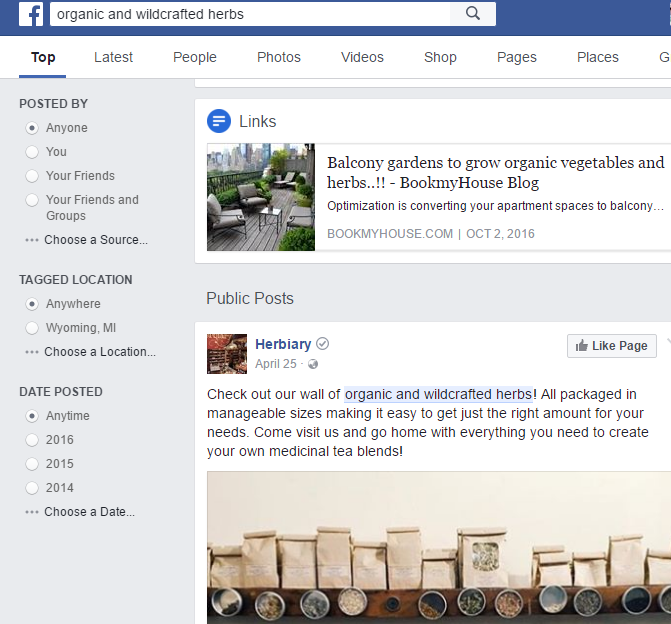 Let's say someone searches Facebook for “organic and wildcrafted herbs.” The search results they will get will include links and public posts on Facebook that use that keyword. An increase in the visibility of your social media content may not DIRECTLY impact your search ranking. ...And more relevant users are more likely to click on, and engage with your content. The content is relevant to them because they were specifically searching for it using relevant keywords. Since the content is relevant to them, they are likely to take some time to read it. This also means they will spend more time on your website, helping to decrease your bounce rate. The same goes for keyword-optimized Facebook pages. 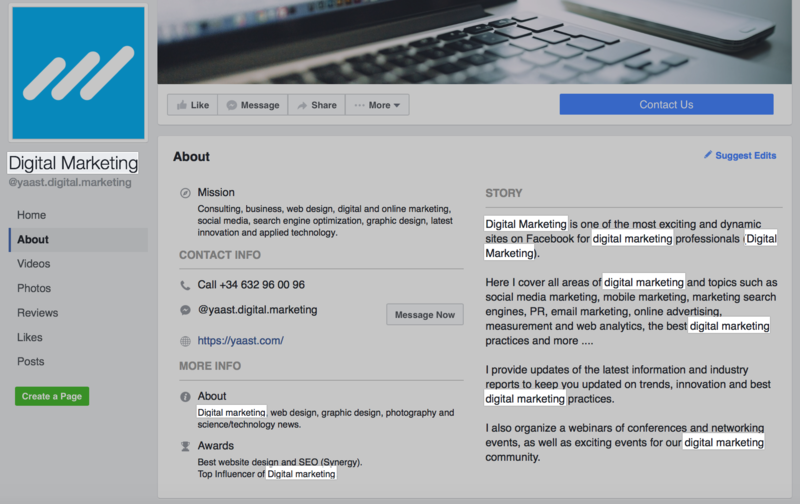 When you create an official page for your business, you have the option to add a description. Using relevant keywords in your description is essential if you want a relevant audience to find you. The more effectively your Facebook page is optimized, the more visible it will be. 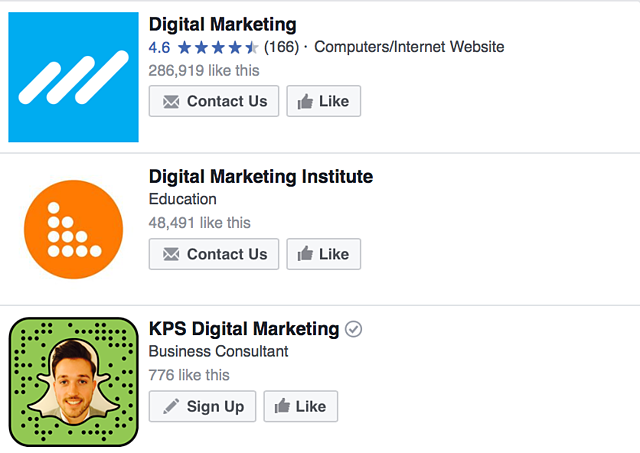 Let’s try searching for “digital marketing” on Facebook. The top accounts have the keyword in their page name as well, which also increases visibility. If we take a closer look at the “About” section of the top-ranking account, we can see that the keyword “digital marketing” appears 7 times. 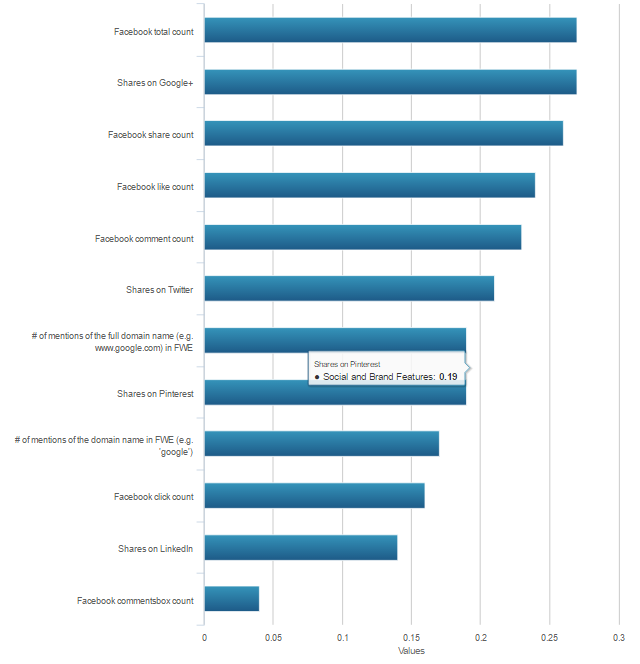 But it’s still clear that a keyword-optimized Facebook page is important for high visibility. You may be wondering how this affects SEO. In truth, there is no DIRECT connection between the two but there is a correlation. The goal is to attract relevant users who will interact with your content, click on your links, visit your site, and even share your content. When you optimize your Facebook account with relevant keywords, you improve your visibility. You also and make it easier for potential followers to find you using those keywords. The more followers you have, the better your chances of getting more shares, website visits, and engagement. In other words, using keywords to optimize your Facebook content helps you reach a more-relevant audience. ...Both of which are factors used to determine a website’s search ranking. 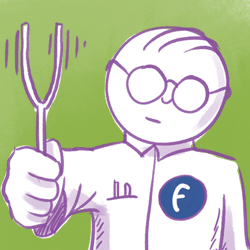 You now have a better understanding of the correlation between Facebook and SEO. 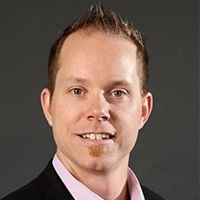 Now I’m going to help you with some effective ways to optimize your Facebook business page for SEO. 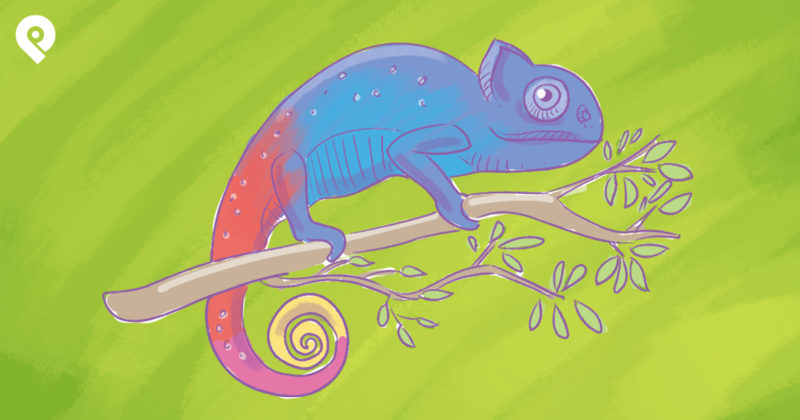 A custom URL matching your business name is a must when optimizing your Facebook page. While this might seem like an obvious step, it is quite easy to overlook. Matching your Facebook URL with your brand or business name promotes brand recognition. This means it will be easier for people to remember your name. ...A custom URL will also make your page easier to find on Facebook and in search engines. If you don’t create a custom URL, Facebook will generate an automated URL that may be long, and difficult to remember. 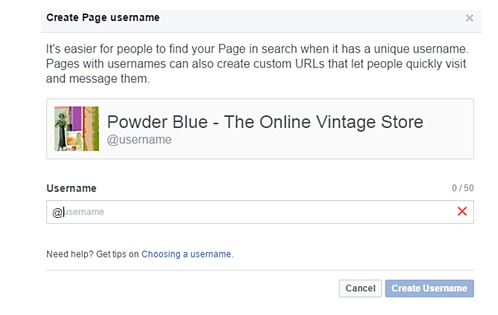 To create a custom URL for your brand Facebook page, access the “About” section of your page. You will get a pop-up window, where you can create a username for your page. Enter the name of your business as the username, which will then become your Facebook page URL. Once customized, the new URL will be much simpler, and shorter than the long, automated one that contained numbers, letters, and other characters. Your “About” section is where people can find out more about your business, who you are, and what you do. This is also the section that you need to optimize with relevant keywords so that your target audience can easily find you. Conduct thorough keyword research to find the most relevant keywords for your business. Choose 1 or 2 of the most relevant, high-traffic keywords. Write an informative description of your business, using those keywords often. Don’t go overboard! The description should sound natural, and not repetitive. In addition to the “About” section, try using the keywords strategically in other parts of your page. For instance, you can add a keyword to the page title, along with your business name. While you should try to avoid overusing keywords, you can use them sparingly in the page name, URL, description, etc. 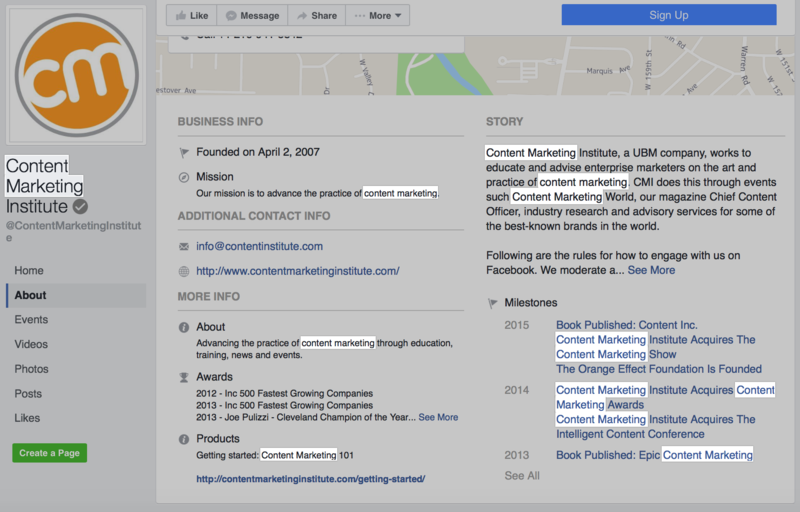 See how The Content Marketing Institute uses the “content marketing” keyword in their page description and business info. Facebook displays the location, business hours, and contact info for your business on the main page of your Facebook profile. For the Facebook page of a restaurant, the “About” section shows their address, phone number, and website. This makes it easy for potential customers to find out how to contact you, and where your business is located. But that isn’t the only reason you need to include your location and other business info on your Facebook page. ...And that will make it easier for local searchers to find your business page. The Facebook page shown above is for a Sacramento-based restaurant. They have their address, and other business info properly updated. 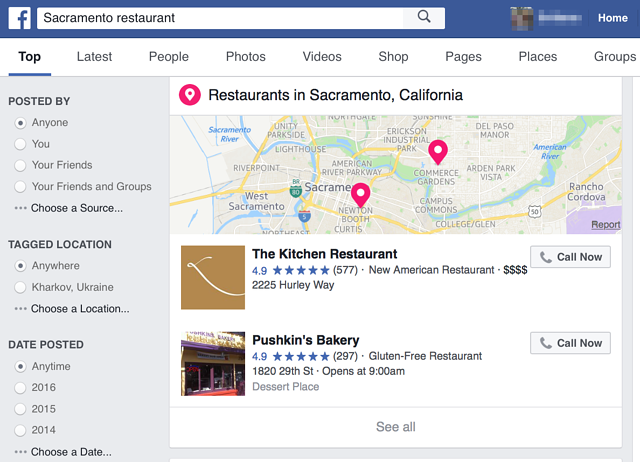 So, when we search Facebook for a, “Sacramento restaurant,” it comes up as one of the top results, (as seen in the screenshot below). After optimizing your Facebook business page for SEO, you will need to make a continuous effort to optimize your updates and posts. This means using keywords to make your posts more visible to relevant searchers. As I mentioned earlier, using relevant keywords in your Facebook posts can make it easier for relevant searchers to find those posts. Write an interesting description for the content you share, and include the right keywords. You also need to include relevant keywords in your meta descriptions. Meta descriptions are snippets that tell people a little bit about the content on a web page. The meta description will show up in the search results page when you conduct a search using a relevant keyword. For example, if we search for “social media advertising” on Facebook, the following post is one of the top results. Take a look at the screenshot below. The description contains the keyword “social media” and the meta description - the complete keyword. This means people looking for posts related to social media advertising will be able to easily find the post, click on it, and read the article. Simply sharing your content on Facebook may not be enough to get people to click. When you share links to your blog posts, or product pages on Facebook, include a call-to-action (CTA) that asks users to DO something specific. For example, you can ask them to click on the link, share your post, or comment on the post. Whatever the desired action may be, end your descriptions with a compelling CTA that clearly tells people what you want them to do. 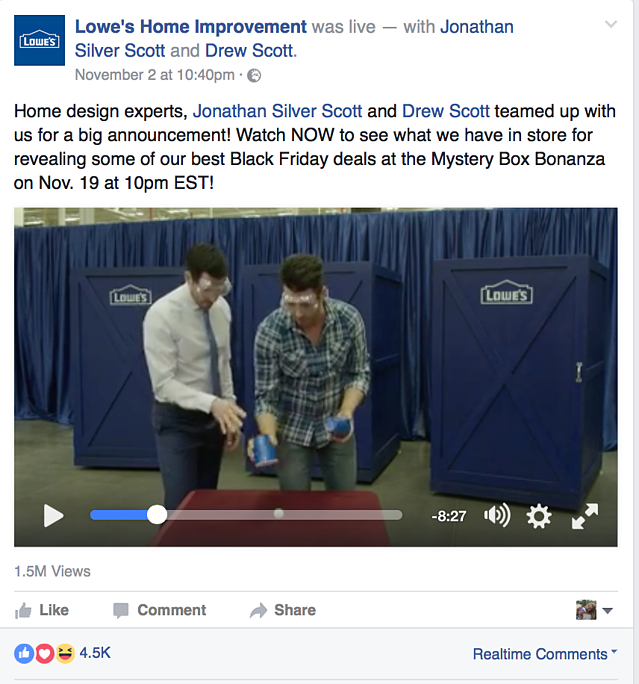 For example, Lowe’s Home Improvement asked people to “Watch NOW”, because the desired action was for people to watch the video. 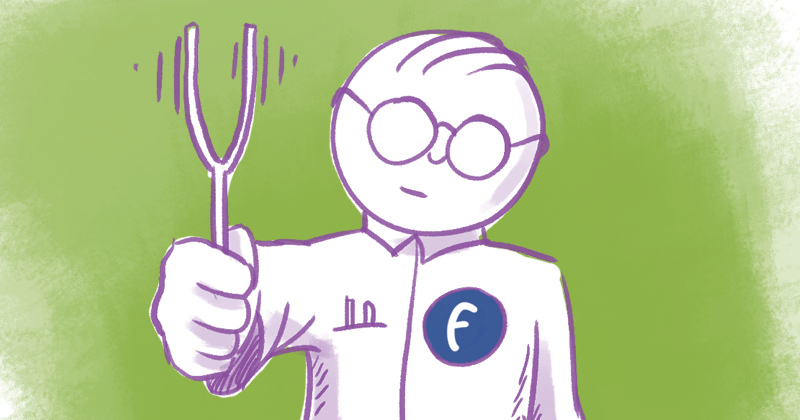 We’ve taken an in-depth look at the correlation between Facebook and SEO. ...You’ve also learned some actionable tips to help you get started. Feel free to contact me if you need further help optimizing your social media for better search ranking.